The real pokemon isn't 1 color. cause that's easier if it's one color. No use for those school drawings. new weird text and new text border. Text border looks okay but I prefer the font graphics of G/S/C to this. i think i will change them fatter. I prefer GSC font too. Honestly, your font make it more hard to read the text and to make it fatter will make it more worst than this. Also, bulbasaur head are to big to fit with vulpix body and lion have a different nose from a frog. :D , yeah about the lion .. :) i will change sprite. Floral green style text box's pallete. as you see in the first picture - everything is fine , in the cherrygrove. in the 2nd picture everything is fine too but now im in route 30.
now in the 3rd picture, you can see that the building's half moved to blocks to the right. and in the 4th picture . 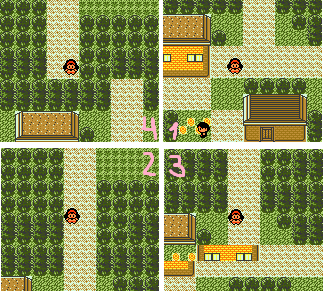 In route 30 i went into the grass , and started a encounter .. so when i go back to the city , the whole place has moved 2 blocks. It looks like something is a bit off in the connection data, but most of it is right. It looks like you have the pointers for the connection strip and all that right, but the part that does the x or y movement might be a little off. Try adjusting that and see if it fixes the problem. i didn't touch the connection data,and how can i adjust the x or y? Well did you resize one of the maps? because that would make the connection data not be right as well, but it definitely looks to be a problem with the connections. and the map connection editing is still to hard for me , i don't understand i a lot of thing in the thread. Well if you like you could send me what you have on either msn or email and I'll take a look at it today and see if I can fix it for you. the rom? sure .., where can i send it to you? thanks.. just wait for the file. Check your mail mate, got it fixed. The email you replied to was the first one I sent, when I replied from my blackberry during class saying that I got it. The next one I sent maybe an hour later with the rom attached and saying what I fixed. It claimed it sent, but I can send it again if it didn't go through. again! no files appearing. :"( can you like put in somekind of (mediafire) or any other file host websites? and send the address thru the email? now i can finally get back to hacking. could help me the last time? :D , there's nothing wrong with the game just i need the correct numbers to insert the titlescreen.